Literature References: Selective serotonin 5HT4-receptor partial agonist. Prepn: R. K. A. Giger, H. Mattes, EP 505322; eidem, US5510353 (1992, 1996 both to Sandoz); K.-H. Buchheit et al., J. Med. Chem. 38, 2331 (1995). Clinical pharmacology: S. Appel et al., Clin. Pharmacol. Ther. 62, 546 (1997); and pharmacokinetics: idem et al., J. Clin. Pharmacol. 37, 229 (1997). Clinical trial in irritable bowel syndrome: S. A. Müller-Lissner et al., Aliment. Pharmacol. Ther. 15, 1655 (2001); in female patients: J. Novick et al.,ibid. 16, 1877 (2002). Review of clinical efficacy: B. W. Jones et al., J. Clin. Pharm. Ther. 27, 343-352 (2002); of mechanism of action, efficacy and safety: M. Corsetti, J. Tack, Expert Opin. Pharmacother. 3, 1211-1218 (2002). Therap-Cat: Gastroprokinetic; in treatment of irritable bowel syndrome. Keywords: Gastroprokinetic; Serotonin Receptor Agonist. In 2000, originator Novartis established an alliance with Bristol-Myers Squibb for the codevelopment and copromotion of tegaserod maleate, which is now available in more than 55 countries worldwide for the treatment of IBS with constipation. In 2015, Zelnorm was acquired by Sloan Pharma from Novartis. Novartis’ brand name Zelnorm (tegaserod) had originally received approval from the US FDA in 2002 for the treatment of irritable bowel syndrome with constipation (IBS-C) [5, 8]. It was, however, voluntarily withdrawn from widespread use in the US market in 2007 after concerns arose over the possibility that tegaserod could potentially cause dangerous cardiovascular events in patients [5,8]. Since then, closer evaluations of the original data suggesting such cardiovascular risk have resulted in the limited reintroduction or ‘re-approval’ of tegaserod for treatment of IBS-C specifically in female patients less than 65 years of age and whom are considered to be at a lower risk of a cardiovascular event than the broader population . Zelnorm (tegaserod) by Sloan Pharma subsequently gained re-approval in April of 2019 . Nevertheless, tegaserod remains un-approved in certain regions . On 30 March 2007, the United States Food and Drug Administration requested that Novartis withdraw Zelnorm from shelves. The FDA alleges a relationship between prescriptions of the drug and increased risks of heart attack or stroke. An analysis of data collected on over 18,000 patients demonstrated adverse cardiovascular events in 13 of 11,614 patients treated with Zelnorm (a rate of 0.11%) as compared with 1 of 7,031 patients treated with placebo (a rate of 0.01%). Novartis alleges all of the affected patients had preexisting cardiovascular disease or risk factors for such, and further alleges that no causal relationship between tegaserod use and cardiovascular events has been demonstrated. On the same day as the FDA announcement, Novartis Pharmaceuticals Canada announced that it was suspending marketing and sales of the drug in Canada in response to a request from Health Canada. In a large cohort study based on a US health insurance database, no increase in the risk of cardiovascular events were found under tegaserod treatment. Currently, tegaserod may only be used in emergency situations only with prior authorization from the FDA. It is to be understood that where tautomeric forms occur, the present invention embraces all tautomeric forms and their mixtures, i.e. 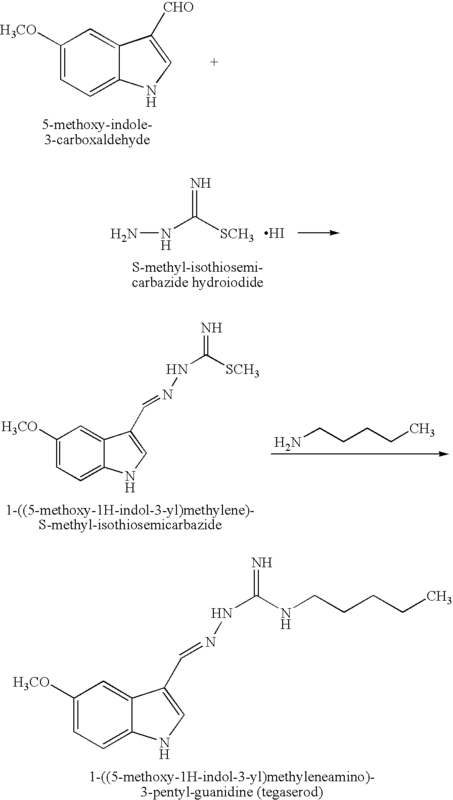 although S-methyl-isothio-semicarbazide and 1-((5-methoxy-1H-indol-3-yl)methylene)-S-methyl-isothiosemi-carbazide are mostly defined for convenience by reference to one isothiosemicarbazide form only, and although tegaserod is mostly defined for convenience by reference to one guanidino form only, the invention is not to be understood as being in any way limited by the particular nomenclature or graphical representation employed. When an S-methyl-isothiosemicarbazide salt is used in the process of the present invention, this may be an acid addition salt with acids, including but not limited to inorganic acids such as hydrohalogenic acids (for example, hydrofluoric, hydrochloric, hydrobromic or hydroiodic acid) or other inorganic acids (for example, nitric, perchloric, sulfuric or phosphoric acid), or organic acids such as organic carboxylic acids (for example, propionic, butyric, glycolic, lactic, mandelic, citric, acetic, benzoic, salicylic, succinic, malic or hydroxysuccinic, tartaric, fumaric, maleic, hydroxymaleic, mucic or galactaric, gluconic, pantothenic or pamoic acid), organic sulfonic acids (for example, methanesulfonic, trifluoromethanesulfonic, ethanesulfonic, 2-hydroxyethanesulfonic, benzenesulfonic, p-toluenesulfonic, naphthalene-2-sulfonic or camphorsulfonic acid) or amino acids (for example, ornithinic, glutamic or aspartic acid). Preferably the S-methyl-isothiosemicarbazide salt is a hydrohalide (such as the hydrofluoride, hydrochloride, hydrobromide, or hydroiodide) or a sulfonate (such as the methanesulfonate, benzenesulfonate, or p-toluenesulfonate). Preferably the S-methyl-isothiosemicarbazide salt is S-methyl-isothiosemicarbazide hydroiodide. The following synthetic scheme demonstrates a preferred process of the present invention. The invention is now demonstrated by the following non-limiting illustrative example. 5-Methoxy-indole-3-carboxaldehyde (1.5 g, 1 eq) and S-methyl-isothiosemicarbazide hydroiodide (3.99 g, 2 eq) in methanol (15 ml, 10 vol) were stirred in the presence of triethylamine (3 ml, 2 vol) at 25-30° C. for 2 hours. After completion of the reaction, the methanol was removed by distillation under reduced pressure at 45-50° C. and ethyl acetate (10.5 ml, 7 vol) was added to the residue to precipitate out the product. 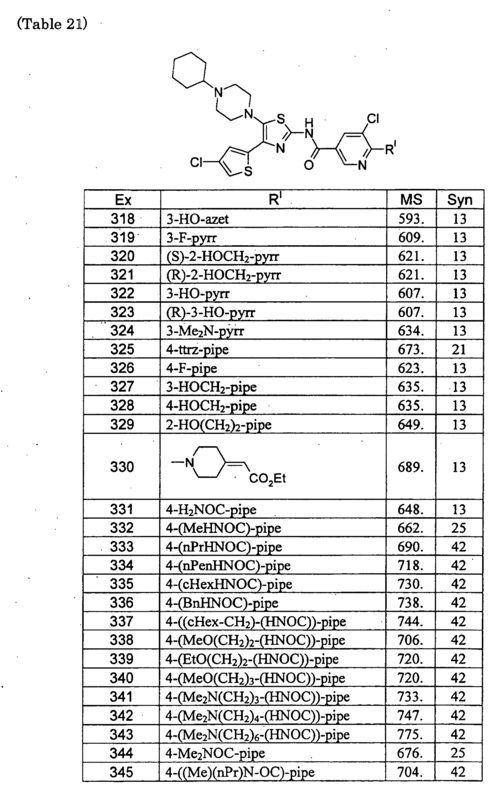 The product, 1-((5-methoxy-1H-indol-3-yl)methylene)-S-methyl-isothiosemi-carbazide, was separated by filtration, washed with ethyl acetate (3 ml, 2 vol) and dried under vacuum at 45-50° C. The yield was almost quantitative (˜100%). A solution of 1-((5-methoxy-1H-indol-3-yl)methylene)-S-methyl-isothiosemicarbazide (8.0 g, 1 eq) and n-pentyl amine (2.65 g, 1 eq) was refluxed in methanol (8 ml, 1 vol) at 66° C. for 4 hours. After completion of the reaction, the methanol was removed by distillation under reduced pressure at 45-50° C. to obtain tegaserod free base as a yellowish brown solid. Yield=97%. HPLC purity=95%. 1-((5-Methoxy-1H-indol-3-yl)methyleneamino)-3-pentyl-guanidine (55 g, 1 eq) was taken in methanol (357.5 ml, 6.5 vol) and stirred. To this reaction mixture was added at room temperature a solution of maleic acid (74.15 g, 3.5 eq) in water (137.5 ml, 2.5 vol) and the reaction mixture stirred for one hour at room temperature. The solid obtained was then filtered through a Buchner funnel and dried at 700 mmHg and 500° C. Yield=36.8 g, 48.42%. HPLC purity=99.45%. EV 320 251 655 US Powder X-ray diffraction (“PXRD”) analysis using a SCINTAG powder X-ray diffϊactometer model X’TRA equipped with a solid-state detector. Copper radiation of λ=1.5418 A was used. The sample was introduced using a round standard aluminum sample holder with round zero background quartz plate in the bottom. TGA/SDTA 85 r, Mettler Toledo , Sample weight 7-15 mg.
To a mixture of 90 g MICHO and 63 g NaOH [47 %] was added a solution of 212 g AGPΗI dissolved in 566 mL of water at room temperature. The resultant reaction mixture was heated to 400C. After 3 hours, 522 mL of ethyl acetate was added and the reaction mixture was stirred for an additional hour. The organic phase was washed with water (3 x 450 mL), and vacuum filtered. After addition of 211 mL ethyl acetate and 870 mL of n-propanol, the mixture was heated to 600C and a solution of maleic acid (86.5 g in 180 mL water), at the same temperature, was added to the reaction mixture and stirred at the same temperature. After 2 hours the reaction mixture was cooled to about 100C and stirred for an additional hour. The resulting solid was filtered off, washed with n-propanol, and dried in a vacuum oven over night to give 195.8 g of tegaserod maleate Form B. According to the prescribing information (Physician’s Desk Reference, 57th Ed., at Page 2339), tegaserod as the maleate salt is a white to off-white crystalline powder and is slightly soluble in ethanol and very slightly soluble in water. Tegaserod maleate is available commercially as ZELNORM®, in which it is present as crystalline form. Tegaserod maleate is disclosed in US patent No. 5,510,353 and in its equivalent EP 0 505 322 (example 13), and is reported to have a melting point of 1900C (table 1 example 13). methanol/diethylether. Tegaserod base prepared according to this general method is characterized solely by a melting point of 155 0C (table 3 compound 5b). 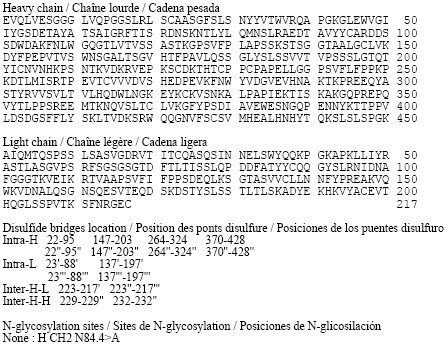 Additional Tegaserod maleate characterization was done by 1H and 13C-NMR according to the literature (Jing J. et. al., Guangdong Weiliang Yuansu Kexue, 2002, 9/2, 51). WO 04/085393 discloses four crystalline forms of tegaserod maleate. The search report for WO 04/085393 further identifies WO 00/10526, and Drugs Fut. 1999, 24(1) which provides an overview for tegaserod maleate. Additional crystalline forms of tegaserod maleate are provided in WO 2005/058819, one of which is characterized by an X-ray Diffraction pattern having peaks at 15.7, 16.9, 17.2, 24.1, 24.6 and 25.2±0.2 two theta (designated as Form B in that PCT publication). The solid state physical properties of tegaserod salt may be influenced by controlling the conditions under which tegaserod salt is obtained in solid Form. Solid state physical properties include, for example, the flowability of the milled solid. Flowability affects the ease with which the material is handled during processing into a pharmaceutical product. When particles of the powdered compound do not flow past each other easily, a formulation specialist must take that fact into account in developing a tablet or capsule formulation, which may necessitate the use of glidants such as colloidal silicon dioxide, talc, starch or tribasic calcium phosphate. formulating syrups, elixirs and other liquid medicaments. The solid state Form of a compound may also affect its behavior on compaction and its storage stability. These practical physical characteristics are influenced by the conformation and orientation of molecules in the unit cell, which defines a particular polymorphic Form of a substance. The polymorphic form may give rise to thermal behavior different from that of the amorphous material or another polymorphic Form. Thermal behavior is measured in the laboratory by such techniques as capillary melting point, thermogravimetric analysis (TGA) and differential scanning calorimetry (DSC) and may be used to distinguish some polymorphic forms from others. A particular polymorphic Form may also give rise to distinct spectroscopic properties that may be detectable by powder X-ray crystallography, solid state C NMR spectrometry and infrared spectrometry. The discovery of new polymorphic forms of a pharmaceutically useful compound provides a new opportunity to improve the performance characteristics of a pharmaceutical product. It enlarges the repertoire of materials that a formulation scientist has available for designing, for example, a pharmaceutical dosage form of a drug with a targeted release profile or other desired characteristic. The polymorphic forms may further help in purification of tegaserod, particularly if they possess high crystallinity. In the event of metastability, a metastable polymorphic form may be used to prepare a more stable polymorph. Hence, discovery of new polymorphic forms and new processes help in advancing a formulation scientist in preparation of tegaserod as an active pharmaceutical ingredient in a formulation. 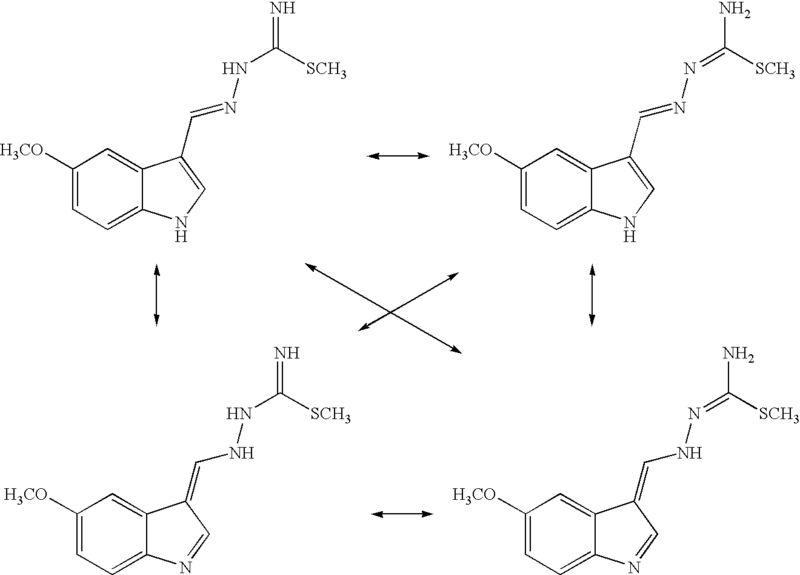 The present invention provides an additional polymorphic form of a maleate salt of tegaserod. To a mixture of AGPΗI (112.7 g) in 283 mL of water was added 5-MICHO (45 g) followed by NaOH (52.8 g, 47%) and stirred at room temperature. After three hours, 522 mL of ethyl acetate were added and the mixture stirred for an additional four hours. After phase separation at 400C the organic phase was washed with water (3 x 218 ml), and filtrated under vacuum. The resulting solution was heated to 60 0C and a solution of maleic acid (14.4 g) in 45 mL water was dropped during half hour, and the reaction mixture stirred at the same temperature for an additional two hours. The mixture was cooled to 100C during one hour, kept under stirring at the same temperature for 12 hrs and then filtered under vacuum. The wet product was washed twice with 65 ml of ethyl acetate and dried in a vacuum oven at 45°C for 16 hours to give 85% of the product. 45 gr MICHO were added to a 1 L reactor at RT. A solution of 112.7 gr of AGP HI and 283 ml water was added to the reactor. 52.8 gr of NaOH 47% were added to the mixture while stirring. The mixture was heated to 400C and stirred for 12 hrs. 522 ml of Ethyl Acetate were added and the mixture was stirred for 4 hrs. After phase separation at 400C the organic phase was washed with water (3 x 218 ml), and filtrated under vacuum. The mixture was heated to 600C and a mixture o 14.4 gr of Maleic Acid in 45 ml water was dropped during 5 min. The mixture was stirred at 600C for 2 hrs. The mixture was cooled to 100C during 1 hour, stirred at 100C for 13 hrs and then filtered under vacuum. The wet product was washed twice with 65 ml of n-Propanol. The wet product was dried in a vacuum oven at 45°C. 6.9 g of maleic acid were added to a slurry of Sesqui-Tegaserod maleate Form H2 (41.5 g) in 208 ml n-propanol at room temperature. The mixture was stirred for 5 hours at the same temperature, filtered and washed with n-propanol. After drying on vacuum oven at 450C for 15 hours the product was analyzed by XRD and found to be Form B (89% yield). In order to obtain only the maleic salt, the product when using an acid halide (HA) or other acids has to first be converted into the free base, before the addition of maleic acid (Path a), which results in an additional step to the synthesis. On the other hand, the reaction of the present invention in the presence of organic or inorganic base results in the formation of tegaserod free base which gives only the maleate salt after the addition of maleic acid (Path b). Example 1- Preparation of Tegaserod maleate in water with HCl. To a mixture of AGP-HI (10.88 g, 0.04 mol) in 25 mL water was added 5-MICHO (3.50 g, 0.02 mol) followed by HCl (37%) until pH 4. The mixture was heated to reflux for 1 hour and then cooled to room temperature. To the resulting slurry was added a solution of NaHCO3 (10%) until pH 9, and heated to 65°C for 20 minutes. After cooling, 100 mL of EtOAc were added, and the organic phase washed with water. A solution of maleic acid (3.48 g, 0.03 mol) in 100 mL EtOAc was added, and the resulting solid was filtered off and washed with EtOAc to give 6.27 g of crude tegaserod maleate with a purity of 99.70% (by HPLC). 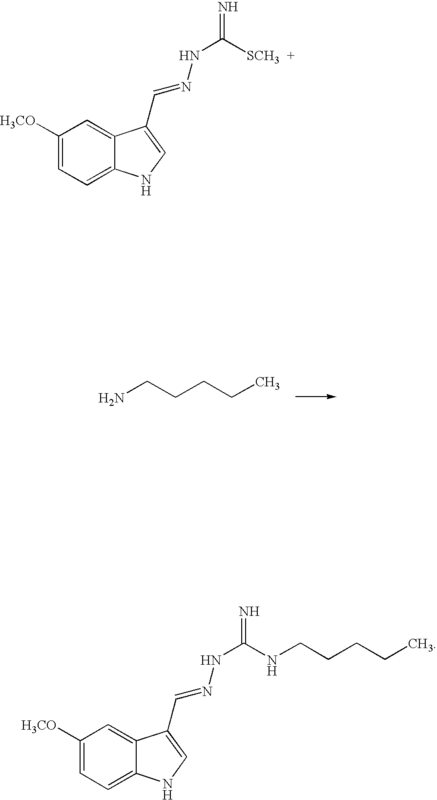 Example 2- Preparation of Tegaserod maleate in water with HCl in two steps. a. Preparation of Tegaserod free base. 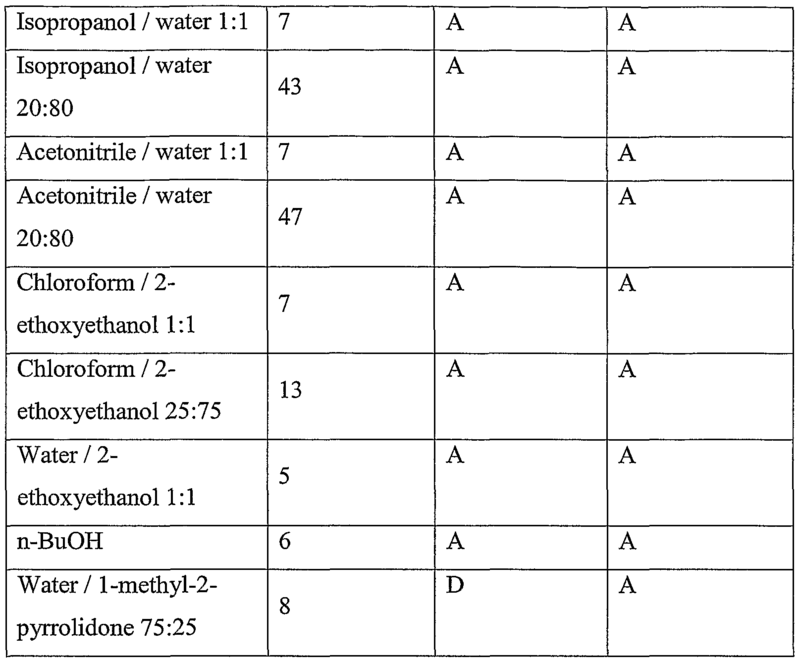 To a mixture of AGP-HI (163.3 g, 0.6 mol) in 375 mL water was added 5-MICHO (52.5 g, 0.3 mol) followed by HCl (37%) until pH 4. The mixture was heated to reflux for 1 hour and then cooled to room temperature. To the resulting slurry was added a liter of a solution of NaHCO (10%) until pH 9, and heated to 65 °C for one hour. After cooling, 1500 mL of EtOAc were added, and the organic phase washed with water. 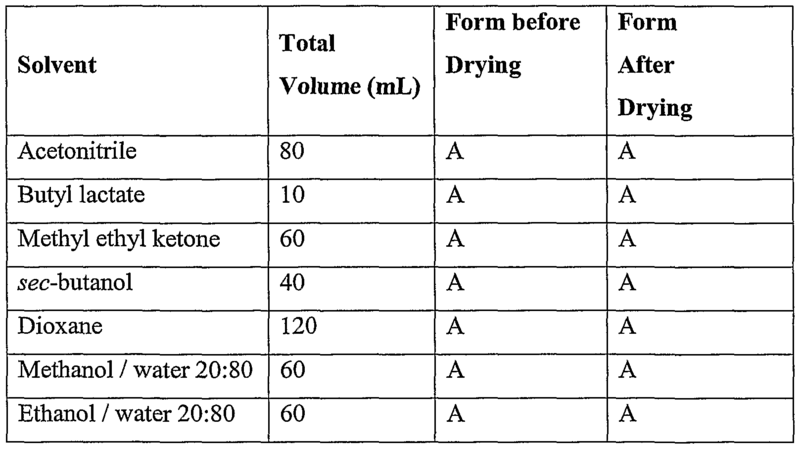 The remaining organic phase was evaporated to dryness to give tegaserod free base with a purity of 87.42 % (by HPLC). b. Preparation of Tegaserod maleate. To a solution of 2 g of tegaserod free base in MeOH was added a solution of maleic acid (1.28 g, 0.011 mol) in 10 mL MeOH. The resulting solid was filtered off and washed with MeOH to give 1.09 g of crude tegaserod maleate with a purity of 96.81 % (by HPLC). Example 3- Preparation of Tegaserod maleate in water with TEA. To a mixture of AGP-HI (10.88 g, 0.04 mol) in 100 mL water was added 5-MICHO (3.50 g, 0.02 mol) followed by TEA (11.0 mL, 0.08 mol) and stirred at room temperature. After one hour, 25 mL of EtOAc was added, and the organic phase washed with water. A solution of maleic acid (3.48 g, 0.03 mol) in 100 mL EtOAc was added, and the resulting solid was filtered off and washed with EtOAc to give 7.92 g of crude tegaserod maleate with a purity of 94 % (by HPLC). Example 4- Preparation of Tegaserod maleate in water with NaHCO3. To a mixture of AGP-HI (10.88 g, 0.04 mol) in 100 mL water was added 5-MICHO (3.50 g, 0.02 mol) followed by NaHCO3 (6.72 g, 0.08 mol) and heated to reflux for 1 hour. After cooling, 50 mL of EtOAc was added, and the organic phase washed with water. A solution of maleic acid (3.48 g, 0.03mol) in 100 mL EtOAc was added, and the resulting solid was filtered off and washed with EtOAc to give 6.71 g of crude tegaserod maleate with a purity of 98 % (by HPLC) . Example 5- Preparation of Tegaserod maleate in water with NaHCO3 in two steps. a. Preparation of Tegaserod free base. To a mixture of AGP-HI (32.66 g, 0.12 mol) in 300 mL water was added 5-MICHO (10.51 g, 0.06 mol) followed by NaHCO3(20.16 g, 0.24 mol) and heated to reflux for 1 hour. After cooling, 150 mL of EtOAc was added, and the organic phase washed with water and evaporated to dryness to give 20.4 g of tegaserod free base (91.55%) purity by HPLC). b. Preparation of Tegaserod maleate. To a solution of 2g of the resulting tegaserod free base in 8 mL MeOH was added a solution of maleic acid (1.28 g, 0.011 mol) in 5 mL MeOH. The resulting solid was filtered off and washed with MeOH to give 2.1 g of crude tegaserod maleate with a purity of 99.63 % (by HPLC). Example 6- Preparation of Tegaserod maleate in water with Na2CO3. To a mixture of AGP-HI (10.88 g, 0.04 mol) in 100 mL water was added 5-MICHO (3.50 g, 0.02 mol) followed by Na2CO3 (4.24 g, 0.04 mol) and heated to reflux for 1 hour. After cooling, 50 mL of EtOAc was added, and the organic phase washed with water. A solution of maleic acid (3.48 g, 0.03 mol) in 100 mL EtOAc was added, and the resulting solid was filtered off and washed with EtOAc to give 6.48 g of crude tegaserod maleate with a purity of 98.2 % (by HPLC). To a solution of 2 g of the resulting tegaserod free base in 10 mL MeOH was added a solution of maleic acid (1.16 g, 0.01 mol) in water. The resulting solid was filtrated and washed with water to give 1.45 g of crude tegaserod maleate as a white solid (94.60 % purity by HPLC). Crystallization in MeOH improved the purity to 98.94% by HPLC. Example 8- Preparation of Tegaserod maleate in IPA with K2CO3. To a mixture of AGP-HI (10.88 g, 0.04 mol) in 25 mL IPA was added 5-MICHO (3.50 g, 0.02 mol) followed by K2CO3 (5.53g, 0.04 mol). After 22 h at room temperature the mixture was washed with brine. 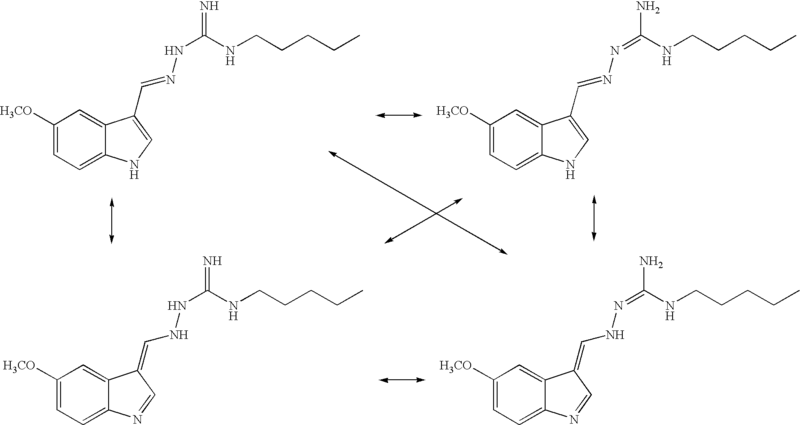 The organic phase was treated with a solution of maleic acid (3.48 g, 0.03 mol) in IPA. The resulting solid was filtrated and washed with IPA to give 3.26 g of a white solid (98.97% purity by HPLC). 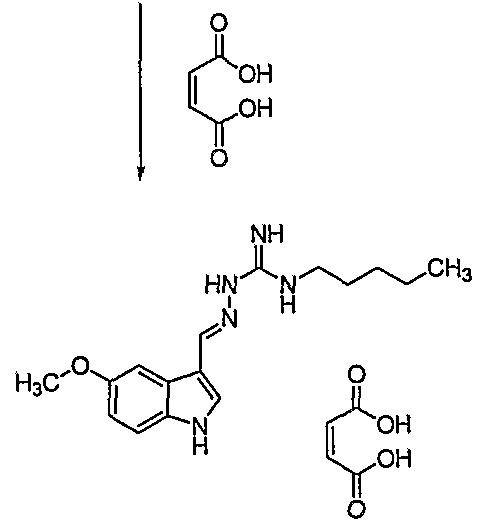 Example 9- Preparation of Tegaserod maleate in TEA. To a mixture of AGP-HI (10.88 g, 0.04 mol) and 5-MICHO (3.50 g, 0.02 mol) was added 11 mL of TEA (0.08 mol). After 2 h at room temperature 25 mL of EtOAc were added and the mixture was stirred for 1 h. The resulting solid was filtrated and washed with 25 mL EtOAc, to give 5.7 g of crude. 2 g of the residue was dissolved in 13 mL MeOH and treated with 7 mL of a solution of maleic acid (2.7 g, 0.023 mol) in water. The resulting solid was filtered and washed with water to give 1.5 g of tegaserod maleate (99.26 % purity by HPLC). Crystallization of the solid in MeOH improved the purity to 99.89%) by HPLC. Example 10- Preparation of Tegaserod maleate in toluene/water with NaHCO3. a. 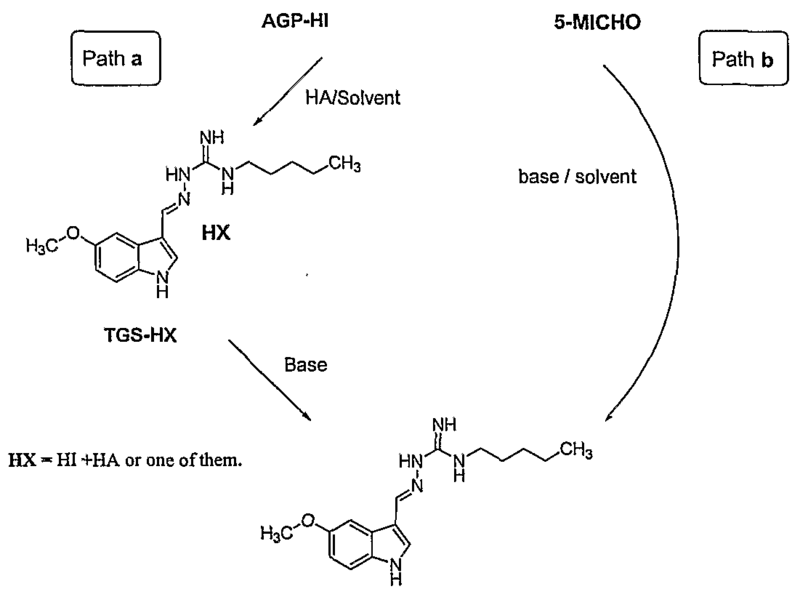 Preparation of tegaserod free base To a mixture of AGP-HI (10.88 g, 0.04 mol) in 200 mL of water/toluene 1:1 was added 5-MICHO (3.50 g, 0.02 mol) followed by NaHCO3 (6.72 g, 0.08 mol) and heated to reflux for 1 hour. After cooling, the solid was filtrated out of the mixture and washed with water. After drying 6.25 g of tegaserod free base was obtained (93.8 % purity by HPLC). b. Preparation of tegaserod maleate To a solution of 3 g of the product in 10 mL MeOH was added a solution of maleic acid (2.31 g, 0.02 mol) in 10 mL water. The resulting solid was filtered off and washed with a solution of MeOH / water to give 2.50 g of crude tegaserod maleate with a purity of 96.6 % (by HPLC). To a mixture of AGP-HI (10.88 g, 0.04 mol) in 25 mL of water was added 5-MICHO (3.50 g, 0.02 mol) followed by NaOH (2 g, 0.05 mol) and stirred at room temperature. After 3 hours 50 mL of EtOAc was added, and the organic phase washed with water and evaporated to dryness to give 5.6 g of tegaserod free base (98.80% purity by HPLC). b. Preparation of Tegaserod maleate. Example 12- Preparation of Tegaserod maleate in water with maleic acid. To a mixture of AGP-HI (10.88 g, 0.04 mol) in 25 mL of water was added 5-MICHO (3.50 g, 0.02 mol) followed by maleic acid (9.3 g, 0.08 mol) and heated to reflux for 1 hour. After cooling, the solid was filtrated out of the mixture and washed with water. After drying 6.92 g of tegaserod maleate crude was obtained (92.4 % purity by HPLC). Example 13- Preparation of Tegaserod maleate in methanol with maleic acid. To a mixture of AGP-HI (10.88 g, 0.04 mol) in 25 mL of methanol was added 5- MICHO (3.50 g, 0.02 mol) followed by maleic acid (9.29 g, 0.08 mol) and heated to reflux for 2 hours. After cooling, the solid was filtrated out of the mixture and washed with water. After drying 6.51 g of tegaserod maleate crude was obtained (97.4 % purity by HPLC). Example 14- Preparation of Tegaserod maleate in water with NaOH in one pot. To a mixture of AGP-HI (10.88 g, 0.04 mol) in 25 mL of water was added 5-MICHO (3.50 g, 0.02 mol) followed by NaOH (2 g, 0.05 mol) and stirred at room temperature. After 4 hours a solution of maleic acid (4.35 g, 0.0375 mol) in 25 mL water was added, and the reaction mixture was stirred overnight. The resulting solid was filtered off and washed with water to give 7.87 g of crude tegaserod maleate (99.16% purity by HPLC). Example 15- Preparation of Tegaserod maleate in water with NaOH in one pot. To a mixture of AGP-HI (174.2 g, 0.64 mol) in 362 mL of water was added 5-MICHO (56.2 g, 0.32 mol) followed by NaOH (68.1 g, 47%) and stirred at room temperature. After 4.5 hours, 640 mL of EtOAc was added, and the organic phase washed with water, treated with active carbon and filtrated through hyper flow bed. A solution of maleic acid (44.57 g, 0.38 mol) in 415 mL ethyl acetate / water 97:3 was added, and the reaction mixture was heating to 65 °C and stirrer overnight. The resulting solid was filtered off and washed with water and ethyl acetate to give 121.4 g of crude tegaserod maleate (up to 99.88 % purity by HPLC). Example 16- Preparation of Tegaserod maleate (from Tegaserod acetate). To a solution of 8.2 g of tegaserod acetate in 15 mL ethyl acetate heated to 65 °C was added a solution of 3.3 g maleic acid in 5 ml ethyl acetate/water 95:5, and the mixture was stirred at the same temperature for an additional 2 hours, followed by cooling to room temperature and stirring overnight. The resulting solid was filtered off and washed with ethyl acetate/water 95:5. After drying on vacuum oven at 45 °C for 15 hours, 9.18 g of tegaserod maleate were obtained. Tegaserod acetate is prepared according to Examples 19, 20 and 21 of U.S. Appl. No. 11/015,875 and PCT/US04/42822. Example 19 of U.S. Appl. No. 11/015,875 reads as follows: A slurry of tegaserod base amorphous (6 g) in 50 mL ethyl acetate was stirred at 20- 30 °C for 24 hours. The solid was filtrated and washed with 15 mL of same solvent and dried in a vacuum oven at 40 °C for 16 hours. A slurry of tegaserod base amorphous (6 g) in 50 mL ethyl acetate was stirred at reflux for 24 hours. The solid was filtrated and washed with 15 mL of same solvent and dried in a vacuum oven at 40 °C for 16 hours. 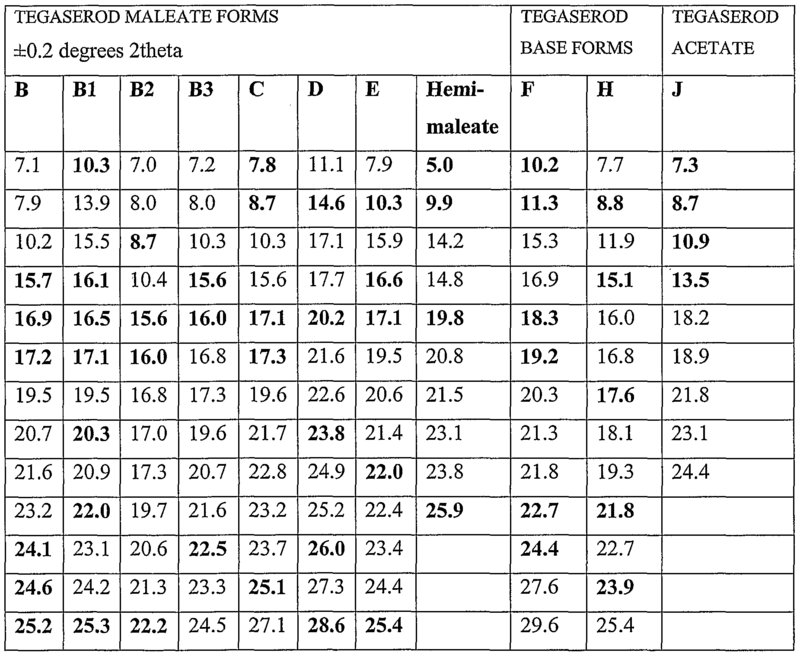 To a slurry of tegaserod maleate Form A (15 g) in EtOAc (210 mL) and water (210 mL) was added 38.4 g of NaOH 47%. The mixture was stirred overnight and the resulting white solid was isolated by filtration and washed with 100 mL of water. Drying in vacuum oven at 40 °C for 16 hours gives 12.38 g (90% yield). Tegaserod acetate was characterized by H and C-NMR. Example 17: General method for the preparation of Tegaserod maleate Form A from crystallization. Tegaserod maleate (1 g) was combined with the appropriate solvent (5 mL), and heated to reflux. Then, additional solvent was added until complete dissolution. After the compound was dissolved, the oil bath was removed and the solution was cooled to room temperature. The solid was filtrated and washed with 5 mL of the same solvent and dried in a vacuum oven at 40 C for 16 hours. 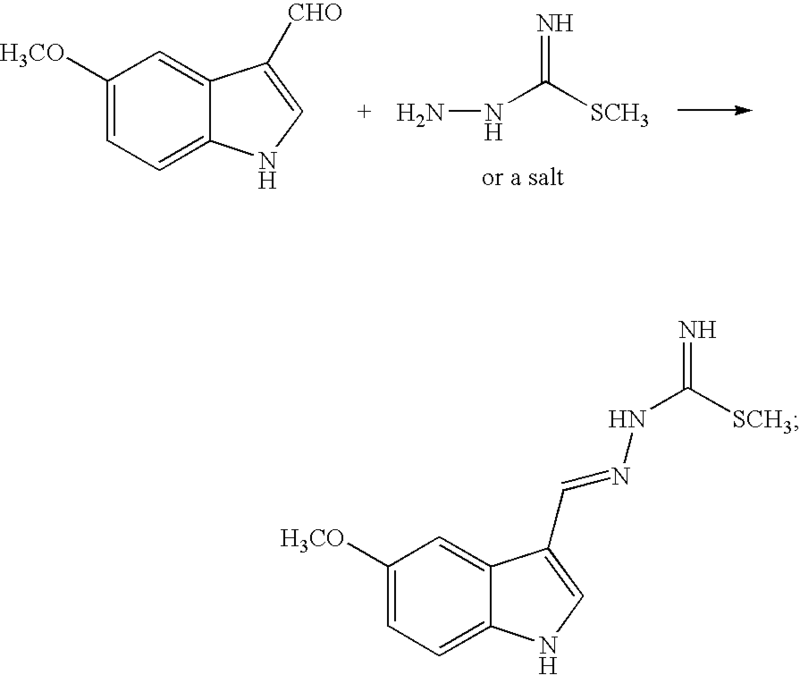 Example 18: Preparation of Tegaserod maleate in water with p-TSOH. To a mixture of AGP-HI (10.88 g, 0.04 mol) in 25 mL water was added 5-MICHO (3.50 g, 0.02 mol) followed by para-toluenesulfonic acid monohydrate (0.45 g, 0.0024 mol). The mixture was heated to reflux for 4 hour and then cooled to room temperature. The resulting solid was filtered off and washed with water to give 8.32 g of a white solid (84.74 % purity by HPLC). To a solution of 1.72 g of Tegaserod Hemi-maleate hemihydrate in 20 mL ethyl acetate at room temperature was added a solution of 0.134 g maleic acid in 5 ml ethyl acetate/water 95:5, and the mixture was stirred at the same temperature for overnight. The resulting solid was filtered off and washed with ethyl acetate/water 95:5. After drying on vacuum oven at 45°C for 15 hours, 1.68 g of tegaserod maleate were obtained. Tegaserod Hemi-maleate hemihydrate was prepared according to Example 23 of U.S. Appl. No. 11/015,875 and PCT/US04/42822. Example 23 of U.S. Appl. No. 11/015,875 and PCT/US04/42822 reads as follows: A solution of maleic acid (2.32 g in 22 mL ethyl acetate/water 97:3) was added to a mixture of tegaserod base in ethyl acetate, and the reaction mixture was heated to 65 °C and stirrer overnight. The resulting solid was filtered off and washed with water and ethyl acetate. Drying in vacuum oven at 40 °C for 16 hours gives 12.19 g of Tegaserod hemi-maleate hemihydrate. Depending on the base polymorph used a solution or slurry is obtained. When using amorphous tegaserod base, a solution is obtained, while when using any other base polymorph of tegaserod, a slurry is obtained. Tegaserod, chemically named 2-[(5-methoxy-liϊ-indol-3-yl)methylene]-IV-pentylhydrazine- carboximidamide, is a selective serotonin 4 (5-HT4) receptor agonist, which can be used to treat gastrointestinal disorders such as heartburn, bloating, postoperative ileus, abdominal pain and discomfort, epigastric pain, nausea, vomiting, regurgitation, intestinal pseudoobstruction, irritable bowel syndrome and gastro-oesophageal reflux. Tegaserod as the maleate salt is marketed for the short-term treatment of irritable bowel syndrome in women whose primary bowel symptom is constipation. Tegaserod, represented by the formula (I), was first described in US 5 510 353 as well as processes for its preparation. The maleate salt of tegaserod is also disclosed, but interestingly a method of manufacturing tegaserod maleate is not disclosed. The only characterizing data is the melting point which is disclosed as 1900C for the maleate salt and 124°C for the tegaserod base. WO 2006/116953 describes crystalline forms of the hydrobromide, dihydrogen phosphate and oxalate salts of tegaserod. Also claimed is a process for preparing the hydrochloride, hydrobromide, dihydrogen phosphate, tartrate, citrate, lactate, mesylate, oxalate, succinate, glutarate, adipate, salicylate, sulfate, mandelate, camphor sulfonate and hydrogen sulfate salts of tegaserod from a specific crystalline form of tegaserod base. Another process described is a method of preparing the dihydrogen phosphate, maleate, tartrate, citrate, mesylate, lactate, succinate, oxalate, hydrochloride, salicylate, glutarate, adipate, hydrobromide, sulfate and hydrogen sulfate from a hydrogen halide salt of tegaserod. There are often major hurdles to overcome before an active pharmaceutical ingredient (API) can be formulated into a composition that can be marketed. For example, the rate of dissolution of an API that has poor aqueous solubility is often problematic. The aqueous solubility is a major influence on the bioavailability of the API such that a poorly soluble API can mean the API is not available to have a pharmaceutical effect on the body. The API can also cause problems during manufacture of a pharmaceutical composition. For example, flowability, compactability and stickiness are all factors affected by the solid state properties of an API. It has thus always been an aim of the pharmaceutical industry to provide many forms of an API in order to mitigate the problems described above. Different salts, crystalline forms also known as polymorphs, solvates and amorphous forms are all forms of an API that can have different physiochemical and biological characteristics. Indeed, it has been discovered that the tegaserod maleate product on the market, Zelnorm , has been linked to an increase in heart problems in a proportion of individuals. One possible reason is that the maleate moiety reacts with the tegaserod, resulting over time in the production of a toxic impurity. This impurity could be a contributor to the heart problems seen in some patients. Figure 1 is a x-ray powder diffraction pattern of tegaserod maleate Form I. Figure 2 is a x-ray powder diffraction pattern of tegaserod maleate Form II. Figure 3 is a x-ray powder diffraction pattern of tegaserod maleate Form III. Figure 4 is a x-ray powder diffraction pattern of tegaserod maleate Form IV. x-Ray powder diffraction spectrum was measured on a Siemens D5000 x- ray powder diffractometer having a copper-Kα radiation. Example 1 Tegaserod free base (10 gm) is dissolved in acetone (100 ml). Maleic acid (4 gm) is added to the solution and the contents are maintained for 1 hour at 25°C. The separated solid is filtered to give 12.5 gm of tegaserod maleate Form I. Example 2 Tegaserod maleate Form II (5 gm) and acetone (70 ml) are mixed and refluxed for 1 hour and cooled to 25°C and filtered to give 4.8 gm of tegaserod maleate Form I. Example 3 Tegaserod maleate Form I (10 gm) is dissolved in methanol (100 ml). Acetonitrile (150 ml) is added to the solution and the contents are heated to reflux. The contents are then cooled to 25°C and maintained for 30 minutes. The separated crystals are collected by filtration to give 9 gm of tegaserod maleate Form II. Example 4 Tegaserod free base (10 gm) is dissolved in methanol (100 ml) and maleic acid (4 gm) is added to the solution. Then the contents are maintained for 30 minutes at 25°C. Then the separated solid is filtered to give 13 gm of tegaserod maleate Form III. Tegaserod maleate (5 gm) is dissolved in methanol (50 ml) and the solution is maintained at 25°C for 30 minutes. The separated crystals are collected by filtration to give 4.8 gm of tegaserod maleate Form III. Example 6 Tegaserod free base (10 gm) is dissolved in methanol (50 ml), maleic acid (4 gm) is added and the contents are refluxed for 30 minutes and then the resulting solution is cooled to 25°C. Methylene dichloride (200 ml) is added and the contents are maintained for 30 minutes at 25°C. The separated solid is collected by filtration to give 13 gm of tegaserod maleate Form IV. Buchheit, K.-H. et al. : J. Med. Chem. (JMCMAR) 38, 2331 (1995). US 5 510 353 (Novartis; 23.4.1996; GB-prior. 22.3.1991). EP 505 322 (Sandoz; GB-prior. 22.3.1991). Tsuji, Y. et al. : J. Org. Chem. (JOCEAH) 55 (2), 580 (1990). Jones, G.B. et al. : J. Org. Chem. (JOCEAH) 58 (20), 5558 (1993). Kondo, Y. et al. : J. Org. Chem. (JOCEAH) 62 (19), 6507 (1997). JP 3 024 055 (Kawaken Fine Chemicals; 1.2.1991; J-prior. 21.6.1989). By DR ANTHONY MELVIN CRASTO Ph.D in Uncategorized on April 16, 2019 .